Saturday was a very full day and I only managed to type up notes! So: a mercifully shorter entry. We drove from Mtwara over to Newala, only about a ninety-minute drive, largely on hard red dirt roads. Along the way, we see many, many, many cashew trees. Cashews are a big crop around here, but in spite of the high prices we pay for cashews in America, they aren’t a huge income source because they take a lot of processing and most farmers here don’t have access to processing facilities, so they have to sell unprocessed nuts and can’t get as good a price. We stopped at a couple of churches along the way. One was St Paul’s, Tandahimba – which means Many Lions. Canon Alex, the priest at St. Paul’s (who also has several other churches he visits), has building experience and is literally building the new church building, next door to his home, as his time and money for materials permit. We also meet Alex’s wife, Desteria, who is a healing prayer minister and evident a woman of spirit (in every sense). And, briefly, their teenaged kids, who are lounging around the compound talking quietly to one another, probably about what weirdos their parents are – isn’t that what teenagers do? Desteria has an infectious smile, makes amazing chapatis, and gives Paula and I matching kangas (the light printed cloths that East African women use for everything – overskirts, head coverings, baby carriers, …. ), with the motto in Swahili: Where God is, love is there. She ties them onto us with great good humor. She leads prayer before we eat and before we leave, with energy and passion and (as far as I can tell) fluency. I love her. St Paul’s seems like the best-kept of the small churches we’ve seen so far. The buliding is run down & the furnishings are minimal but nothing there is broken, the saqcristy is tidy, and the sapce is beautfiully decorated (see photos) from their feast day recently. I take many photos of a bneautifluy little carved Mary, on an altar behind the altar in the sacristy area. At one stop, I hear Bishop Oscar greet two Muslim men cheerfully: “Salaam aleikum.” They reply in kind. Christians and Muslims largely get along just fine here, and have for many, many decades. Our welcome to the cathedral grounds, when we reached Newala, was… amazing. I have no words. So many people, and such warmth. Music and ululation and smiles and drumming. 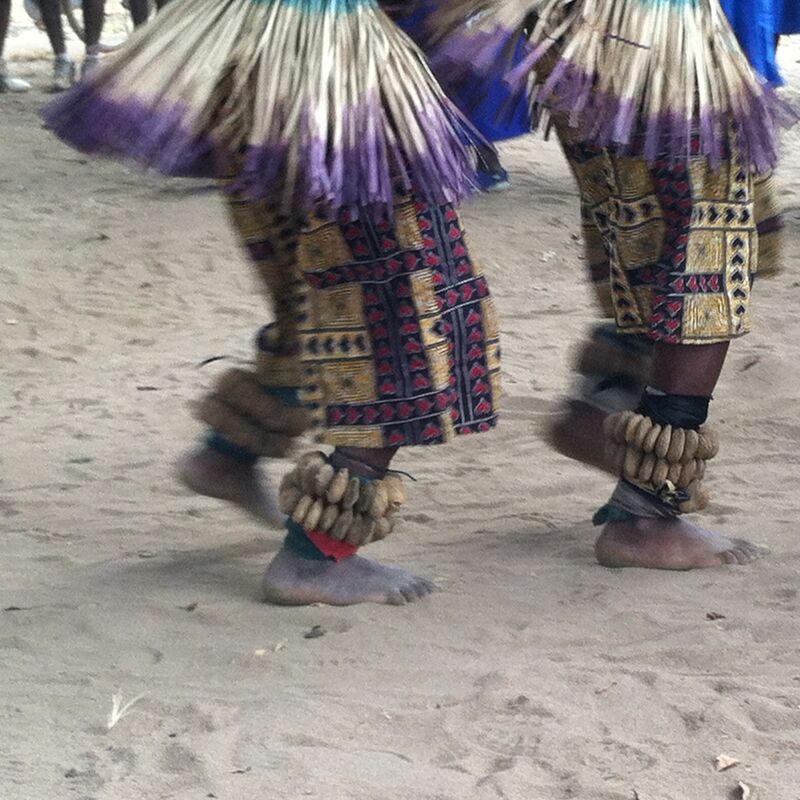 The Mother’s Union dancing with the Makonde dance troupe. A dance-drama about corruption in medical practice, for our amusement (it was AMAZING). Walking in and with a singing crowd into the cathedral, to be formally introduced and welcomed. I felt so full of joy and gratitude. A brand new place, but also a homecoming. There were tears in my eyes often during the afternoon. Dancing and drumming and drama, music and more, and then we go into the (tiny!) diocesan office building and receive a formal welcome from some diocesan leadership. Then we go over to the Sisters of St Mary compound, very nearby, where the welcome is just as warm but where it is blessedly quiet. The sisters feed us tea and doughnuts and cashews, and introduce us to their chickens, and let us collect ourselves. Sister Helena, the superior at this house, is just amazing. They all are. Such warmth and gentleness and hospitality and humor. It feels good to be here. Another home. What do I see so far for us to take home? – gifts to us, from the church in Tanzania? Pragmatism. Entrepreneurship. Resourcefulness. Courage. Holism? – struggling for the right word – a quality of being concerned with, involved with, the whole of its members’ lives. Swahili lessons: we learning how to ask for a toilet (choo) as opposed to a leopard (chewi). We also learn that you’re supposed to spank the Konyagi bottle (hit it sharply on its bottom? what else can I say?) before opening and pouring it. Bishop Oscar has asked Paula and I to celebrate the Eucharist at the cathedral tomorrow, Sunday morning. A first – for a woman to stand at the altar in this diocese – and a great honor. Bishop Oscar hopes to ordain a young woman this winter, the first woman priest in this diocese – one of the first in Tanzania. We spend some time Saturday evening preparing. I want to do the Sursum Corda (the first part of the Eucharistic prayer, with congregational responses) in Swahili. Speaking it would be easy – I took a little Swahili once, and it’s fairly easy to pronounce – but they chant it, so I’ve got to teach that to myself overnight. We pore over the Swahili Missal, trying to get it all sorted out. How amazing it is to be planning to lead worship together here, so very far from home, and the things we’re getting hung up on are, does the Agnus Dei come before or after the Fraction Anthem? That’s the Anglican Communion, right there, and it is a beautiful thing. Bishop Oscar says the only dangers in Newala are witchcraft and gossip. He is visibly more relaxed here. Canon Alex’s motorbike. Essential transport for clergy who serve several churches, separated by rough roads. Paula meets Alex and Desteria’s cow. By the new St. Paul’s building. Note our kangas! Mother’s Union and Makonde dancers! Part of the dance-drama. The guy on the ground is a corrupt doctor who won’t help the pregnant woman until the husband gives him a bribe. He is eventually arrested! The bishops, chatting, in the Sisters’ sitting room.